Big Toe Joint Pain Relief Kit-Standard The Big Toe Joint Pain Relief Kit was carefully designed to provide you with several similar products to successfully reduce pain at the big toe joint. The Big Toe Joint Pain Relief Kit would be beneficial to you if you are experiencing pain underneath the big toe joint directly or with attempted movement upward of the big toe joint. There are two small bones under the big toe joint that can cause pain. The components of this kit are adhesive backed pads that shift the weight off of the painful areas. The kit contains both felt and foam pads. You may order additional felt or foam pads individually in the quantites that you desire. Must specify right or left foot when ordering. The pads are placed directly to the foot. 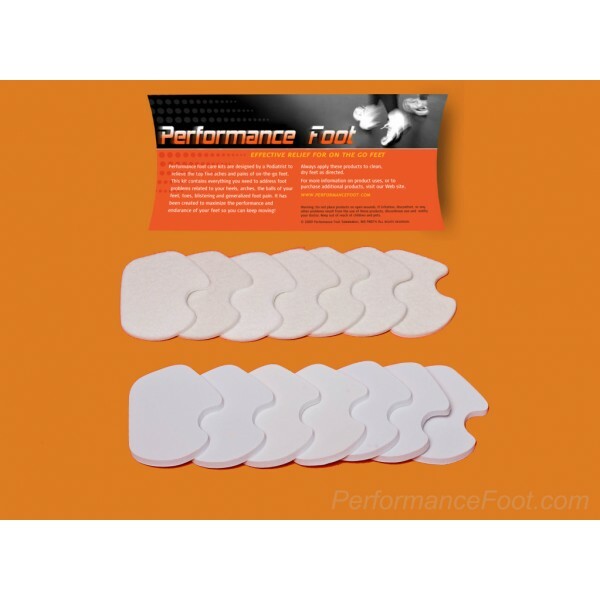 The information listed on Performancefoot.com is a recommendation for Foot Care Guidelines and internet self-diagnosis treatment. If you are experiencing persistent pain, and symptoms that do not improve with treatment of a non-prescription product consult a podiatrist. A foot doctor can correctly diagnose the condition and make appropriate recommendations.